We all know there’s no such thing as ‘perfect’ piano playing, but hopefully these tips might be helpful. The sustaining or damper pedal is one of the most important assets for a pianist. It adds another dimension to the piano timbre, and can provide a whole variety of sound layers. 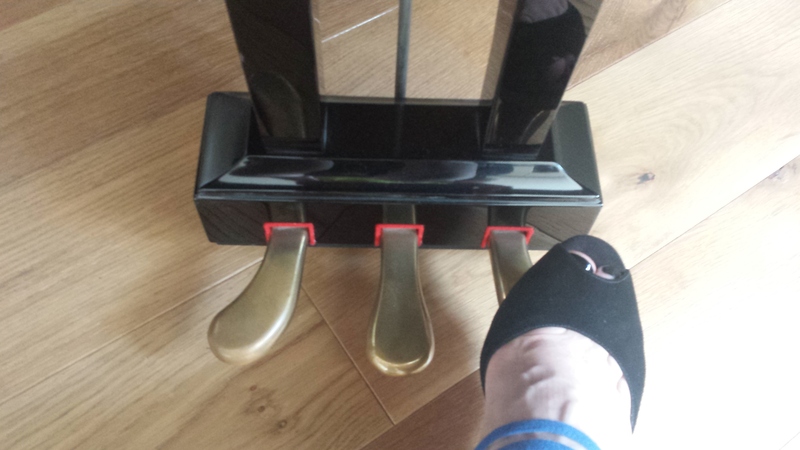 The most commonly used pedal, being the furthest right of the two or three pedals on a standard upright or grand piano, it’s played by the right foot (as demonstrated by my foot in the photo above). When depressed, the sustain pedal literally moves all the dampers away from the strings, which allows them to vibrate with ease, and they will continue vibrating until the sound ceases, or the pedal is released. Look inside the instrument and watch the dampers (on a grand) being lifted as the pedal is depressed. It began life as a hand stop, examples of which survive on some of the earliest instruments. Then a knee lever was introduced around 1765 in Germany, and whilst this was more convenient than the hand stop (and apparently much admired by W A Mozart), the foot pedal is undeniably far easier to operate, and it was introduced sometime during the 1770s by English piano builders. The right pedal enriches piano tone markedly, allowing a pianist to create many colours, add sonority and resonance to passages, as well as conjure shimmering, atmospheric sounds. The most fundamental technique in good pedalling is good listening. We generally pedal with our ears, and being attentive is key, but there are a few different techniques to employ, which can be used on a whole variety of styles. One basic rule; a little sustaining pedal goes a long way. Too much will seriously ruin an otherwise competent interpretation, generally irrespective of the composer or style, which is why it’s a good idea to practice without using any, particularly when starting to learn a new piece. Pedalling is also tricky to write in a score, as it varies constantly, depending on the venue, acoustic, piano, composer, and the list goes on…. To use the pedal, rest your heel firmly on the floor, the right foot should be at an angle of around 30 or 35 degrees. When depressing the pedal (and this applies to the other pedals as well), play with the ball of the foot (or perhaps the big toe – everyone has their own preference here) and take it up (to release the sound) and down (to engage the pedal) quietly. The foot should keep contact with the pedal as much as possible because pedal or foot tapping is not a desired effect. This last paragraph may all seem fairly obvious, but recent adjudicating has shown (to me at least) these points need reiterating. Direct pedalling; which enriches the sound in separated chords. Depress the pedal with a chord (or intended passagework) at the same time as the fingers, and release the pedal with the fingers, producing a clean, clear and sonorous chordal effect, as shown in the example below. Pedal markings are indicated under the score (also as below). Take the pedal down (with the Ped. sign), and where the line is broken with an upward marking, take the pedal up. Depress again, if the pedal is to be played continuously (as in example 2), but if the marking stops then pedal playing must cease too. Legato pedalling; which is akin to syncopated pedalling, overlapping with the notes being played. This involves depressing the pedal a moment later than finger work. To practice this, play a succession of five notes (perhaps C-G in the right hand and F-C in the left hand as shown in the example below). Start by playing middle C, and immediately afterwards depress the pedal, a millisecond after your third finger plays the D, release the pedal and depress again very quickly, to clear the sound of the C. This should be done very quickly and seamlessly, so as to limit smudging. Legato should ideally be all about using the fingers, it’s a finger technique; legato using the pedal is generally for added colour and sonority, or on the occasion where it’s impossible for fingers to join (i.e. in large leaps). Half-pedalling; consisting of a quick movement, to lose top harmonies and retain bass notes. The main aim here is to reduce too much blurring or smudging of sound. Practice by taking the pedal down (and up) varying amounts (but not depressing as far as the foot will go). Half-damping; without engaging the pedal completely, for a light, veiled effect. Employing almost a surface pedalling, there are many variations of this movement, which will clear the sound but still provide an atmospheric haze. Flutter, surface or vibrato pedalling; similar to half-damping, this consists of very quick, light movements, in order to reduce accumulating sound. This pedalling is based on frequent and sometimes irregular changes, and is applied through fast passages work, scales or runs, providing weight to the sound yet ridding it of the blurring effects. Practice on scales, perhaps lightly raising or ‘hovering’ with your foot several times in a two octave scale. If the foot engages the pedal before notes are played, as opposed to once notes have been played (or at the same time), a much more resonant sound ensues as all the strings resonate fully, which can be ideal for a full-bodied sonority, required in certain repertoire. Between the point where the foot is completely depressed to the floor and where it first engages the pedal mechanism, there are many assorted subtleties available to pianists. Every piano is different therefore pedals all feel and sound different too. The sustaining pedal can really add dynamics and shape, due to accumulation of sounds whilst depressed. Keep experimenting and you’ll discover a myriad of ways to enhance your playing.